The decision to end the partnership affects a joint initiative with the Misk Foundation, known as the Misk Grand Challenges. Last year, the $41.3 billion Gates Foundation committed $5 million to the initiative. A month after the death of a prominent Saudi journalist, the Bill & Melinda Gates Foundation has cut ties with a charity founded by the Saudi leader linked to the murder, Crown Prince Mohammed bin Salman. The move to end a partnership between the Gates Foundation and the Saudi-based Misk Foundation, first reported Thursday by Fortune and other outlets, is the latest pullback by a Western organization over the Oct. 2 murder of Jamal Khashoggi, an outspoken critic of the regime and a columnist at The Washington Post. The decision affects a joint initiative with the Misk Foundation, known as the Misk Grand Challenges, that involved “grants to organizations around the world where young people are working in innovative ways on some of the most pressing development challenges,” according to a statement released Thursday by the Gates Foundation. Last year, the $41.3 billion Gates Foundation committed $5 million to the initiative, which was to be matched by the Misk Foundation. The Misk Foundation was launched by the crown prince, Saudi kingdom’s de facto ruler, who Western and Turkish intelligence agencies say ordered Khashoggi’s murder. That made the partnership untenable, Gates Foundation officials said. The Gates Foundation’s decision comes a couple of weeks after a range of prominent business leaders and government officials protested the killing by withdrawing from a business conference hosted by the crown prince. Bill Gates met with the Saudi crown prince last year during a Misk forum in Riyadh, the Journal reported. The two may also have met when the 33-year-old crown prince made a secretive visit to Seattle last May as part of a 3-week U.S. tour designed to shore up the Saudi kingdom’s image in America. 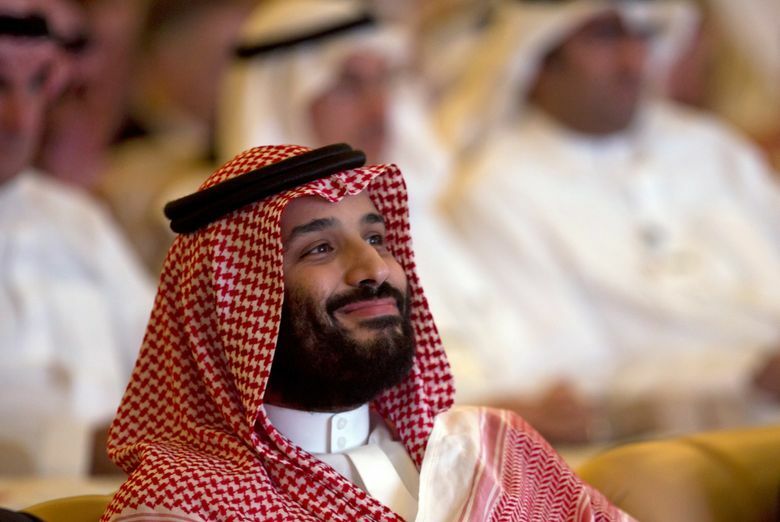 During the Seattle visit, which the crown prince made with a massive entourage aboard his own private 747, he attended the signing of an agreement with Boeing for a $450 million joint venture to provide maintenance for Saudi Arabia’s air force. But the visit did not go entirely as planned. An advance draft of the prince’s itinerary, obtained by the Seattle Times, showed the Saudi leader had also planned to meet with Mayor Jenny Durkan and Gov. Jay Inslee, both of whom politely begged off for scheduling reasons. The visit also drew local criticism from activists who blamed the crown prince for Saudi Arabia’s aggressive bombing of civilians in the Yemini civil war. The Gates Foundation, which so far had paid $1.5 million into the Misk initiative, will continue to support entrepreneurs who had already received funding, but will not support new grants, according to the foundation statement. Although the Misk Foundation had numerous other philanthropic partners, including Harvard University, Google, LinkedIn, and Twitter, it’s not clear whether these partners would follow the Gates Foundation’s lead. Harvard, Google, and LinkedIn did not respond to requests for comment, and a spokeswoman for Twitter declined to comment. Though this was hardly a large project by the standards of the Gates Foundation, the crown prince described the Seattle foundation’s “collaboration” as “an essential initiative for the Misk Foundation,” in a statement last year on the Misk Grand Challenges website, according to a report by Philanthropy News Digest. Callahan said that the benefit to the Misk Foundation would have gone well beyond the $5 million the Gates Foundation had committed, by serving as a base that Misk officials could have used to attract additional contributions from other donors. “Being funded by the Gates Foundation has huge cachet,” he said. Thursday’s decision also highlights a growing dilemma for big players in the world of global philanthropy. On the one hand, youth-focused programs like the Grand Challenges are widely seen as critical in a developing world where hundreds of millions of young people lack education or job prospects. On the other, philanthropies like the Gates Foundation must carefully assess the reputational risks of collaborating with wealthy yet controversial partners, such as Saudi Arabia.